For many homeschool moms, weekly lesson plans are part of their regular routine. Lesson plans help keep us on track and help us ensure that learning is taking place in a progressive and well organized manner. When it comes to creating lesson plans there are no hard and fast rules for doing so. Ultimately, how you decide to create your plans will be determined by what works best for you and your family. Some moms use a spreadsheet to create lesson plans, while others prefer to use a software program. And then there are moms who stand by the trusted method of planning using paper and pencil. Creating lesson plans can be time consuming, especially if you have multiple children on different grade levels. To prevent lesson planning from becoming an all encompassing weekly task, my overall piece of advice is short and sweet. Keep it simple. Here are a few tips to help you do so. 1. Set a date and time for planning. This helps you settle into a routine and prevents last minute and late night planning sessions. 2. Think about the activities for the coming week. Doctor’s appointments, instrumental lessons, playdates, field trips, etc will affect your plans for the week. Be sure to consider these things when you plan and then build your plans around these events. 3. Review last week’s lesson plans. Were you able to zip ahead in math because your son quickly and competently breezed through his math lessons? Do you need to go back and spend time helping your daughter revise her history essay? Use last week’s progress to determine your course of action for the coming week. Tie up loose ends before starting something new. 4. Don’t plan too much. If you find yourself ahead of schedule that is great! If you find yourself ahead of schedule that is great!. If you over-plan and can’t meet the goals you set, you may become frustrated. Also, if you plan too much, you may feel the need to push through just for the sake of getting done. 5. Be flexible. Don’t let your lesson plans hold you hostage. Life is fluid. Things happen. Children get sick. Moms get sick. A field trip lasts longer than intended because you get stuck in traffic. Likewise, you could receive an invitation to a great educational outing. Don’t miss out on a great educational opportunity just because it wasn’t written down in your lesson plans. 6. Plan what’s best for YOUR family. Just because your homeschool buddy is doing a fantastic unit on ancient Egypt featuring sugar cube pyramids and chicken mummification doesn’t mean you have to do the same. Your family dynamic may not allow you to do those things right now and that’s perfectly fine. Craft lessons that meet your children’s needs. Don’t frustrate yourself by trying to keep up with others. 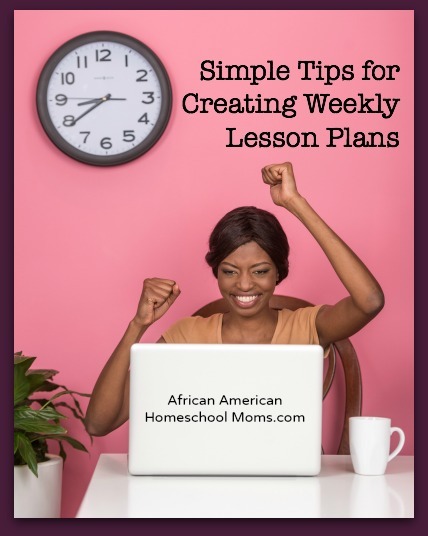 Lesson planning is often an essential aspect of a mom’s homeschool responsibility. Even though it’s important, lesson planning should not be overwhleming. Do you have any tips for planning lessons? If so, please leave a comment letting me know. I’d love to hear what you do. Some people believe that in order to homeschool, a family needs a seemingly endless list of supplies and a huge budget. This is far from the case! By employing proper planning and carefully determining what is needed, families can gather the materials they need in order to homeschool successfully. 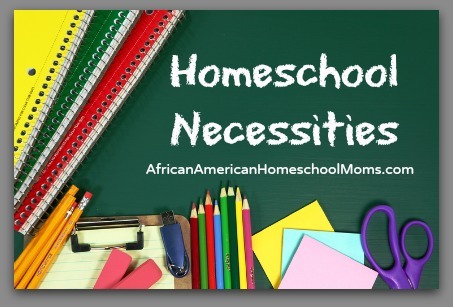 I recently asked the moms in the African American Homeschool Moms Facebook group to share their list of homeschool must haves. These knowledgeable ladies have offers up some great suggestions. Library cards: A library card will give your family access to a wide array of resources. You can check out books and DVDs on a variety of topics and use the library’s computers to work, research and play games. Library card holders will also be able to register for special library events such as story times, Lego club meetings, and craft times, not often available to non card holders. Pencil sharpener: Pencils are a necessity in any classroom setting and the homeschool environment is no exception. Buy a high quality pencil sharpener that will survive frequent use and endure lots of wear and tear. Art supplies: You don’t have to purchase easels, fancy paint, or state of the art color palettes. For the average homeschool family, a ream of basic construction paper, a few boxes of sturdy crayons, some bottles of paint, a few pairs of scissors, bottles of glue, and few gluesticks will be just fine. Computer and Internet access: In this technological age, many families would find it difficult to school without a computer and an internet connection. As I mentioned earlier, you can use the computers at the library, but most families will prefer the convenience and privacy of home computing. During the school day, we use our computer to watch supplemental YouTube videos, take online classes, and of course to play the educational games my children love so much. Printer/Copier: A few years ago we began to use downloadable books from a great website called CurrcClick. Though downloadable books or e-books as they’re often called, don’t cut into our valuable storage space, we must always have a printer/copier and ink cartridges to copy or print out what we need. Paper: Our paper stash includes lined paper, colorful construction paper, butcher paper for large art projects, and printer paper. We use each of these types of paper for a variety of educational projects and activities. Curriculum: Every homeschool family needs to decide what they’ll use to teach their children. Purchased curriculum is the go to method for most homeschool families, but there are a variety of free homeschool curricula and materials as well. To see a great list of free homeschool resources, please check the Freebies link in the top menu bar. Balls: Playtime is a necessary part of homeschooling. Just as our children’s minds need to be stimulated, we need to remember that their bodies need stimulation as well. Help keep your children active and physically fit by providing them with materials they need to exercise. Give them time to play with footballs, basketballs, soccer balls, baseballs, and bouncy balls. Homeschooling does not have to be expensive. Once you’ve secured all of your homeschool necessities and you’re happily using them, you may wish to branch out and purchase additional items to make your homeschooling easier.